The stress of divorce can cause parents to want to vent to their children, and oftentimes conflict arises in front of them. However, parents need to remember that kids can become stressed out themselves by exposure to conflict. Do you hope to make your divorce as easy as possible for your children? Parents often face very stressful situations during a divorce. Sometimes stress can cause parents to vent to their children, and conflict can surface in front of them. 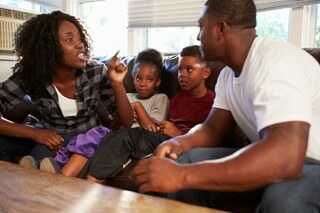 It is important to realize that children become anxious when they are exposed to family conflict. Children rely on their home environment for stability and comfort in order for them to develop emotionally. When there is conflict, it can feel as though their world is crumbling, and their sense of safety and trust becomes compromised. Certain issues that seem trivial to adults are intensified a great deal in the mind of a child. If you have fought in front of your children, or have said negative things to them about your ex, it’s not too late to do the right thing. You and your ex-spouse are beginning a different relationship as co-parents. Resolving anger and resentment will make your life much easier, and it will make for a relaxed transition. If you need professional help with resolution, get it quickly. Your children will thank you for finding peace, and your interactions with your ex will become stress-free. 2. Discuss issues only when children are not around. It is very important to deal with conflict at a lunch meeting, or another place where children cannot hear. This does not mean going into the bedroom to raise your voice. Children are very perceptive, so even if they can’t hear exactly what you are saying, they know you are fighting. They immediately become frightened, and if this continues they can develop persisting issues with anxiety. 3. Don’t burden children with adult problems. Children can panic when they hear parents complaining about money, custody, or other issues that they don’t fully understand. They immediately think their hockey league or other expenditures are the reason for your worries. It’s best to vent about these issues with another adult. Children usually blame themselves, and when there is a divorce or separation they become even more sensitive. 4. Speak only positively about your ex. Dealing with an ex can be extremely challenging. When you make negative comments, know that you are attacking either your child’s mother or their father. When you experience the urge to point out your ex’s flaws, imagine how it would feel if someone was attacking one of your parents. Even if your ex is not the best role model, pointing this out only damages their relationship further, and children will eventually resent you for these comments. If you change your attitude and only speak highly of your ex, they will be humbled by your maturity during this difficult time. 5. Ensure they understand the divorce is not their fault. You can never tell your children too many times that they are not responsible for the divorce. Repeatedly explain that divorce happens because relationships change over time, and adult issues are complicated. Emphasize your love for them, and tell them daily that they are not to worry about adult problems. Tell them to concentrate on being children and good students, and that you as parents will solve any problems that may arise. Unfortunately your marriage has ended for one reason or another, but you can ensure your children don’t have to deal with the consequences of their parents’ decisions. Find positive ways to nurture your child’s relationship with your ex. Your optimism will relieve them, and they will be glad to take a break from worrying about their family situation. When they are old enough to make sense of their childhood, they will be extremely grateful that you took control of your behavior and left them out of conflict.